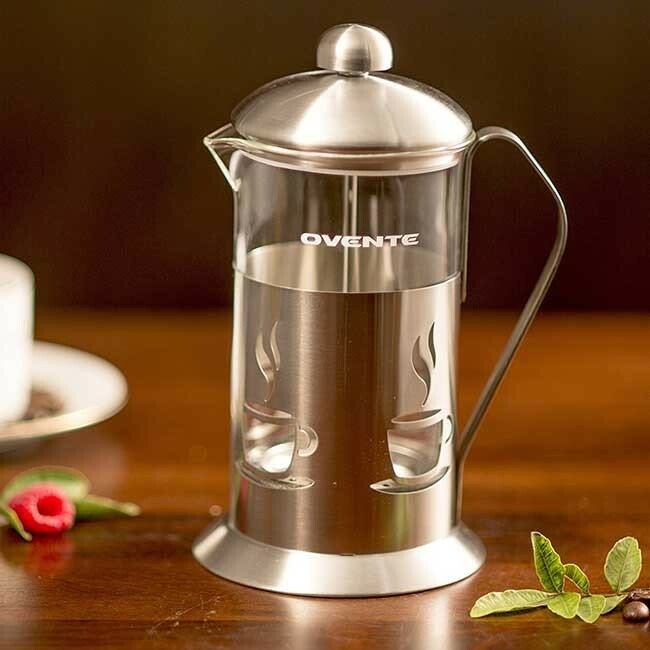 ENGINEERED TO MAKE THE BEST BREWS – The Ovente Premium French Press has a 3-part stainless steel plunging system: It uses a fine stainless steel mesh that effectively filters and extracts all the oils and flavors packed in each coffee bean. 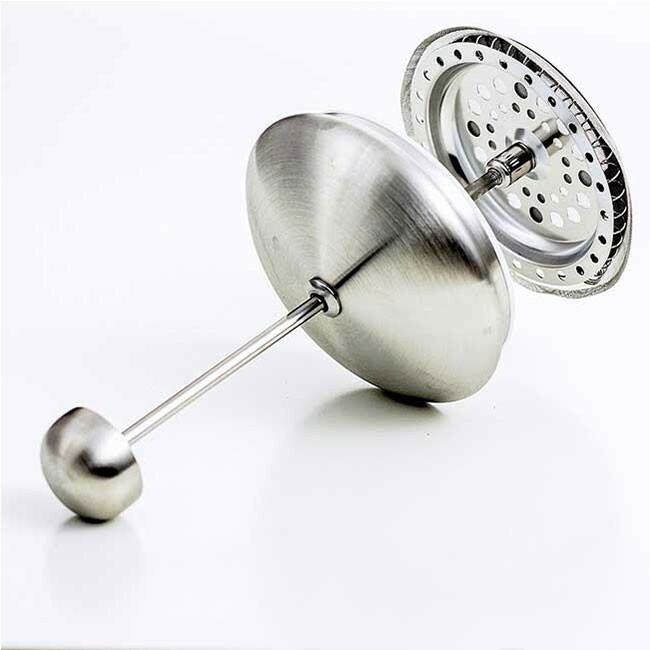 This one transforms drinking coffee from a morning routine to a delightful coffee experience! VERSATILE – This French press can make hot cups of coffee and tea, but you can use it for brewing and mixing other drinks, too! You can use it to make decadent loose-leaf teas, fresh-pressed juice, fruit-infused water, sangrias, cocktails, chicken stock, even to wash quinoa and strain veggies! DURABLE & HIGH-QUALITY – The three-part plunging system is made of stainless steel, and the carafe—finished with a stainless steel shell—of heat-resistant and temperate borosilicate glass. With its durable build, this one can last you years even if you use it every day. STYLISH – This elegant coffee maker isn’t for the dirty kitchen alone. It’s designed to flatter any dining table or work desks with its classy designs, which are available in 6 styles: Classy Café, Stylish Horizontal Stripes, Elegant Leaf Curve, Bronzed Fleurs, Dashing Diagonal, and Sophisticated Square. Although you can get rich-tasting blends—full-bodied espressos and bespoke, single-origin brews—from cafeterias across the different states, did you know that coffee connoisseurs themselves admit that the richest, most vibrant cups of coffee can be made from a simple French press? That glass flask with a stainless steel mesh resting at the end of a movable plunger is what extracts the robust flavors and the aromatic oil from each coffee bean. No wonder a French press coffee is a classic for a reason! 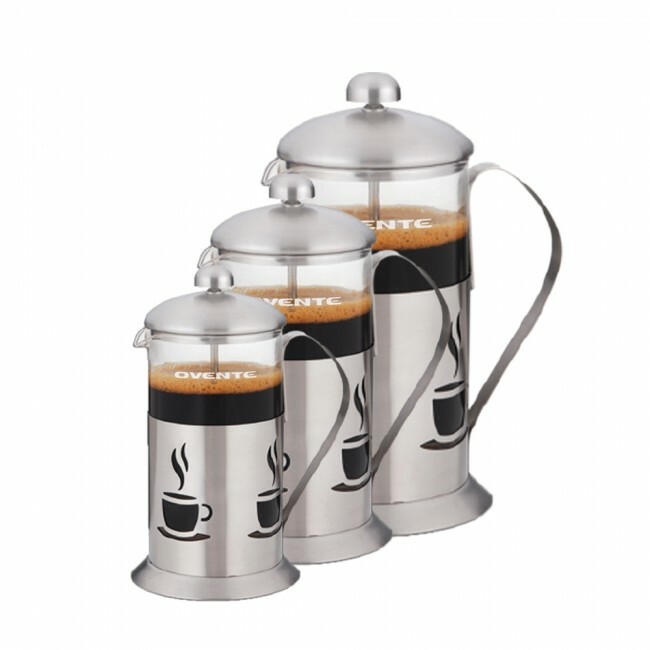 With Ovente’s French press, you can extract all the oils and bold, complex flavors down to the very last coffee ground. You can also use it for hot chocolates, cocktails, and fruit-pressed juices. 3-PART PLUNGING SYSTEM: The French press has a three-layer stainless steel mesh that that provides excellent filtration, leaving you with a smooth cup of coffee with little to no waste. VARIETY OF SIZES: This one is available in three different sizes: 12 oz, 20 oz, and 34 oz (1005 mL) that can hold 8 cups. If you want a bigger carafe, you can opt for the 34 oz so you can have a cup of coffee for yourself and some more you can share with your friends! FREE MEASURING SCOOP: You’d be sure your brews won’t taste too bitter or too bland. Each French press coffee maker unit comes with a FREE 7-gram measuring scoop so you can measure how much product you put in the carafe. DISHWASHER SAFE: To clean, simply disassemble the parts and throw them into the dishwasher. You can also clean it by using warm, soapy water. Always grind your coffee beans before use. Coarse grounds are better suited for this French press. Please be extremely careful when handling your press, especially when hot.